KYIV, Ukraine -- Ukraine's President Viktor Yanukovch has warned foreign governments against meddling in the country's internal affairs, in an apparent swipe at the West. Speaking in a televised interview Thursday, Yanukovych said it was unacceptable "for someone to be coming here and to teaching us how to live." 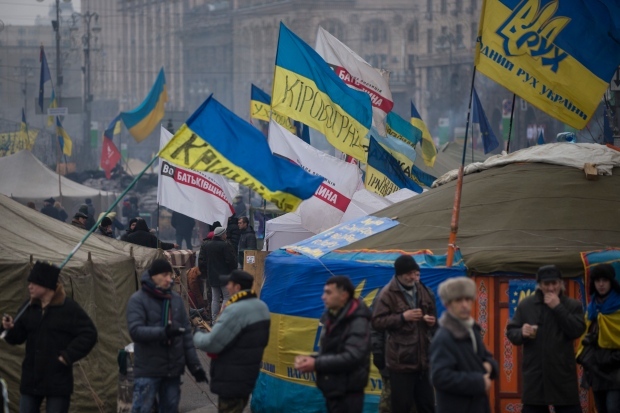 The comments were apparently aimed at top Western diplomats who have recently visited and expressed support for the massive anti-government demonstrations that have rocked Kyiv for nearly a month. The comments came two days after Yanukovych received a major bailout from Russia in order to keep the struggling Ukrainian economy afloat. The Moscow accords were condemned by the opposition as betrayal of national interests. This is a breaking news update. AP's earlier story is below. Ukraine's President Viktor Yanukovych says the government may partially commit to a Russian economic union that has been denounced in mass protests against the government. Yanukovych said on television Thursday that the Cabinet is analyzing which parts of the Moscow-led customs union Ukraine should join. Yanukovych's statement was likely to anger thousands of protesters who have barricaded themselves in the capital over the past month. They want Yanukovych to reverse his pro-Moscow course and turn back toward integration with the European Union. Yanukovych's comments came two days after Russian president Vladimir Putin announced a major bailout package for Ukraine. The deal includes a purchase of $15 billion in Ukrainian bonds and a sharp discount for Russian natural gas.